Hurricane Maria made landfall Wednesday in Puerto Rico as a Category 4 storm, dumping at least 37 inches of rain and damaging many homes and churches. The storm also caused extensive damage in Dominica before continuing toward Turks and Caicos and the southeastern Bahamas. As of Friday, at least 30 people have been killed. The hurricane, which is the strongest Puerto Rico has experienced in more than 80 years, severely damaged several Caribbean islands that received the brunt of Hurricane Irma earlier this month. Puerto Rico is currently without power, adding to the widespread power loss caused earlier by Hurricane Irma. Much of the island is also without potable water. In addition to cutting off power and water supplies, the storm is also triggering widespread flooding. Many streets transformed into rivers, compounding the wreckage caused by the winds and rain. 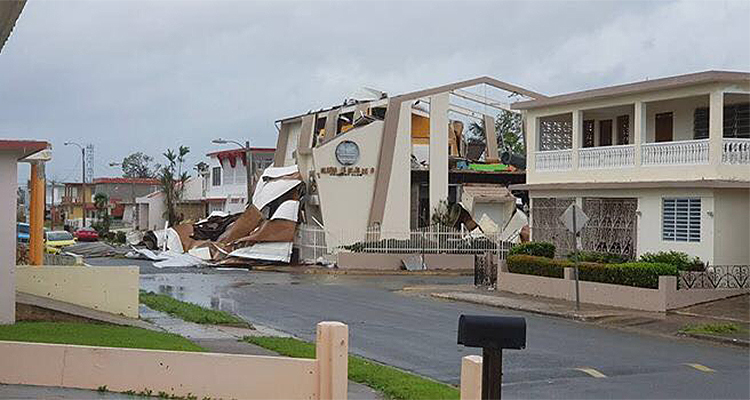 At least two Nazarene churches were severely damaged in Puerto Rico. Entire walls and large portions of the Cataño Church of the Nazarene building were destroyed. Hurricane Maria is the third major hurricane to hit the Carribean in the last month, causing additional damage to already vulnerable areas. Local churches will do their best to respond, though food, water, and medical supplies are already hard to come by. Please pray for those facing the devastation left by the hurricane, which will take many months to repair. Pray for those who have lost loved ones and the hundreds of people without homes. Pray for the recovery of the places that have been hit hard and the swift delivery of the supplies and care they need. Pray for those who are bracing for the storm, asking that they will be kept safe and that supplies will last. Pray for those who are most vulnerable, especially senior adults, individuals with disabilities, and people living in poverty. Pray for church leaders and churches responding to the needs around them. To send a prayer or note of encouragement, go to ncm.org/pray.